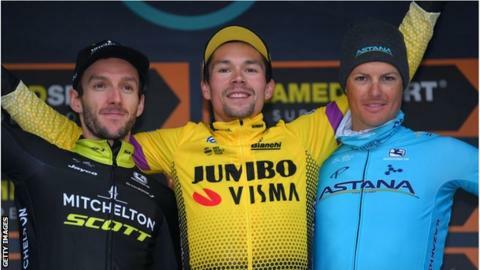 Britain's Adam Yates missed out on the Tirreno-Adriatico title by one second as Primoz Roglic claimed the overall win after the stage-seven time trial. "There wasn't much more I could do, the strongest man won," said Yates. "I said that 25 seconds isn't really enough, but I did a good time trial. I did the best I could." Belgium's Victor Campenaerts of Lotto-Soudal won the time trial in 11 minutes 23 seconds, with Jumbo-Visma rider Roglic finishing 13 seconds behind him. Yates would have become the first British rider to win the Italian race, while Denmark's Jakob Fuglsang (Astana) took third place overall ahead of Tom Dumoulin (Sunweb).